This past year, my best friend in San Francisco, “The Jenius,” traveled to 3 countries and had amazing culinary experiences of 30 Michelin Stars in 30 days. The Jenius’ experience and encouragement as well as our deep bond over food inspired me to step up and try the same – somewhat – as my bank account could allow. In April 2018, I had two incredible dining experiences in two US cities – New York and San Francisco – that are both my home, of 3 Michelin Stars in 3 days. As a fan of Chef Daniel Boulud, I was very excited about my culinary experience at his Michelin Starred restaurant, Daniel. An unforgettable tasting menu of nine courses that took me around the world and blew me away. Here are a few highlights that stood out the most to me. In one of my walks to work from the Montgomery Street BART station to my office in Union Square, San Francisco, I stumbled upon Andersen Bakery, a Danish one, hidden down the stairs of the Crocker Galleria. Attracted by the arrangement of breads and pastries, I had to check it out. 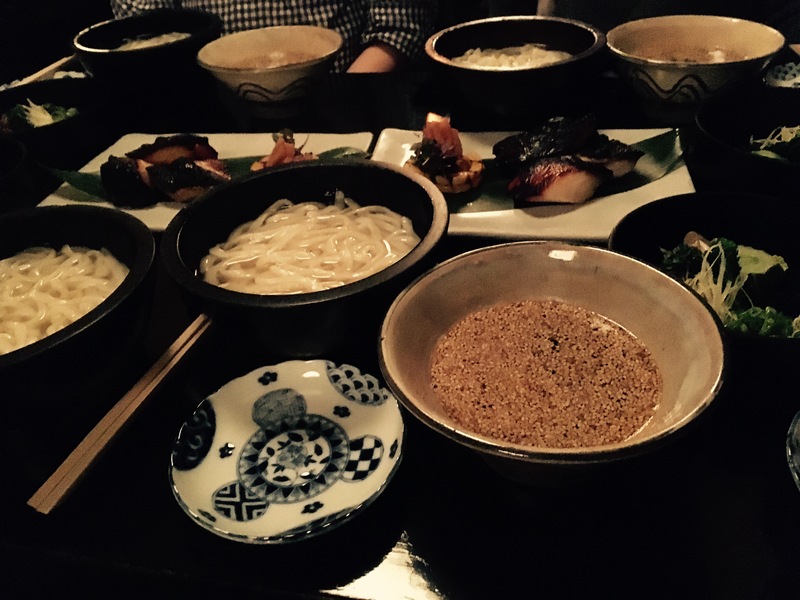 When I’m in the mood for Udon, I love going to Omen A Zen in Soho in New York City. Introduced by a good friend who is an expert on Japanese food, Omen A Zen serves traditional dishes from Kyoto with a modern feel and ambience. For tonight’s meal, my friends and I ordered several dishes to share with our Udon. We had the Agadashi, Black Codfish and Omen (Udon with servings of goodies). With the holidays just around the corner, Hubby and I decided to host a dinner for our friends so we could all spend some quality time together before traveling for the season. Among my group, we have several pescatarians. As the designated chef, I decided to make Rachel Khoo’s Truite en Papillote. It was a big hit for both my friends with dietary restrictions and those that could eat anything. It was simple, yet delicious! 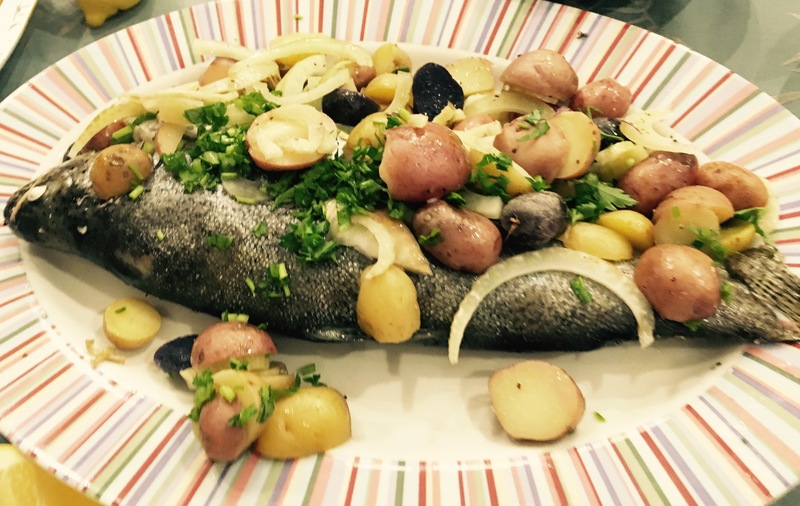 The preparation was fun as my friends were my sous chefs, and Rachel’s recipe gives you room to be creative. Hubby and I could not leave Madrid without trying the churros with hot chocolate. For this amazing treat, we went to La Churreria Chocolateria Los Artesanos 1902 at Puerta del Sol. Outdoor BBQs and parties are always such fun in the Summer, especially when you have the long weekend! Hubby and I hosted an intimate gathering with a few close friends for a Pre-4th of July this evening. We decided to do a “French” take on our BBQ, since we all love French food. We made Rachel Khoo’s “Brochettes au Coq au Vin” (Coq au Vin on Skewers). We knew that my French BFF would shudder and lecture us as to why this was not the Coq au Vin. However, Brochettes au Coq au Vin is a fun, fresh take on the French classic. We have all of the elements of the Coq au Vin, deconstructed on a skewer and revitalized as a red wine dipping sauce.